Mount Bromo is probably the most iconic and the most hiked mountain in Indonesia. Mount Bromo is a 2329 meters active volcano, with a crater inside that keeps spewing off white sulphurous smoke until today. The massively big caldera with diameter 10 kilometers is called Tengger caldera, surrounded by the Sand Dunes of fine volcanic sand. Many people is enjoying the breathtaking and magnificent landscape during the sunrise after hiking from nearest city, Probolinggo or Pasuruan. So, let me introduce about the Mount Bromo, the volcano when the beauty and danger of the nature exists in one place. Located some 4 hours drive from Surabaya, the capital of East Java, Mount Bromo is a part of the Bromo Tengger Semeru National Park that covers a massive area of 800 square kilometers. With approximately 50 times erruptions since 1804, Mount Bromo become the main icon in traditional legends and myths. One of the most well-known myth is when a brave prince sacrifice himself in Mount Bromo, so he can save the lifes of Tengger people (the people lived in Mount Bromo area) from the erruption. The myth is still being believed until now. Some people in Tengger do offering to the Gods once of a year through Kasada Festivals. They thrown the vegetables, chickens, and money to the crater of Mount Bromo. The name of Bromo derived from Javanese pronunciation of Brahma, the Hindu creator god, so you can imagine the magical power of Bromo among the locals. What can we do in Mount Bromo? If you planned to go hiking, first don’t forget to prepare your jacket and clothes. 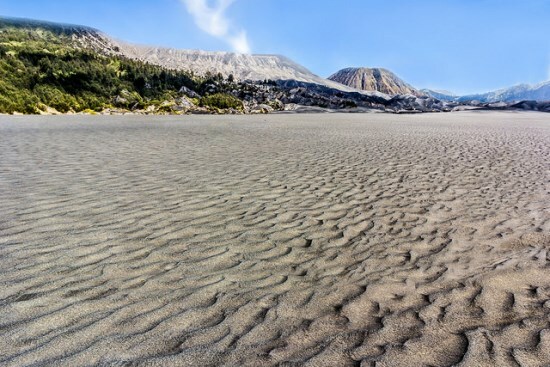 Although Indonesia is a tropical country, the temperature near Mount Bromo is extremely low, with almost 10 degree different from the nearest city. You can also prepare hiking boots, as most of the hikig trek covered by the sands, so wear a comfortable boots saves your energy on hiking. Moreover, Mount Bromo is an active volcanoes, so you must check the information before go hiking for your safety. 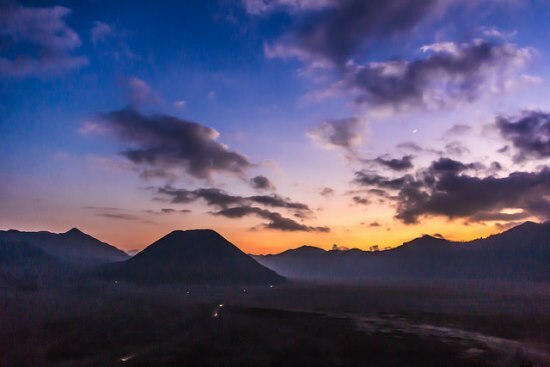 Sun rises at around 05.30 in the morning, so you should hike up Mount Bromo in time to view the sunrise. You can book a travel agent from Surabaya or from Pasuruan or Probolinggo. They are experienced staffs who will lead you to the nearest guesthouse and hotels around Mount Bromo, arrange the rest stops during the hiking, until the top with the best sunrise panorama. For your information, although there are many accomodations nearby, most of them are guesthouses with common facility. If you want more comfortable places, you can stay in Jiwa Jiwa Bromo or some hotel in the base of Mount Bromo. If you don’t want to use the travel agent you can start from Cemoro Lawang, the base at the northeastern edge of Bromo, where the hiking route starting. It takes about 200.000-400.000 rupiahs to get the Cemoro Lawang from Probolinggo city by motorcycles ride drove by locals. You can also use shared public transportation called by PS or Bison costs 40.000 rupiahs. The hiking time takes about 1-2 hours depending on yourself. From our experience, most of the hikers are starting to move in 03.00 in the morning. At this time, you can find a lot of cafes and small restaurant opened serving some foods and breakfast. You can get some food before the hiking to the top of the mountain, to reach the sunrise view. 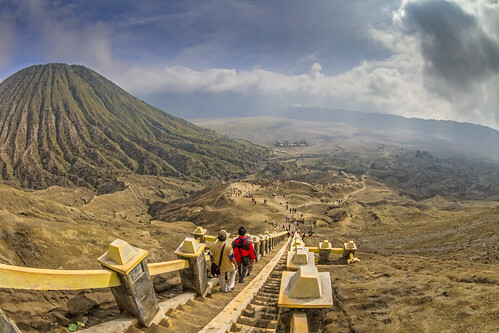 To get the crater of Mount Bromo, you must go up the 250-floors stairs. 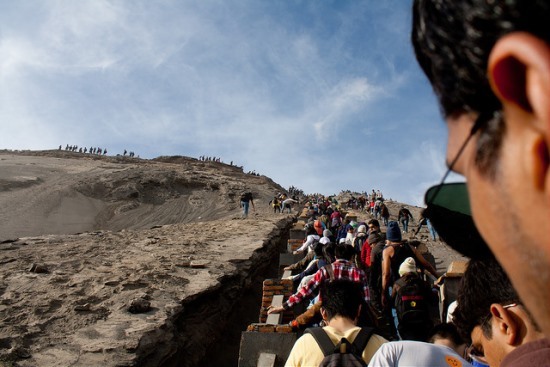 The stair makes it a bit easier to reach the Crater of the Bromo Volcano.­ But recent Bromo eruptions have deposited several feet of volcanic ash over the stairs, which is still partly buried, with steps covered with ash. Upcoming information: now you can go upstairs to see the crater of Mount Bromo. And then, we can see Tengger Caldera, refer to the same name of local people who lived near Bromo, Tengger for hundreds of year. Bromo Sand Dunes is very popular in Indonesia, after appeared in the “Pasir Berbisik” movie. This sand dunes located at 2200 meter. As you see, it has beautiful view, don’t you think Indonesia can also have desert? 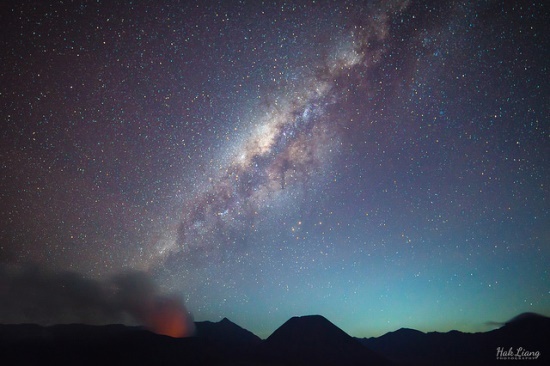 Star gazing became more popular activity in Bromo. But, to experience this, you need an extra work and preparation. The temperatur will go down near 5 degree celcius, but the starry night is worth. On the fourteenth day of the Hindu festival of Yadnya Kasada, the Tenggerese people of Probolinggo, East Java, travel up the mountain in order to make offerings of fruit, rice, vegetables, flowers and sacrifices of livestock to the mountain gods by throwing them into the caldera of the volcano. The origin of the ritual lies in the 15th century legend where a princess named Roro Anteng started the principality of Tengger with her husband, Joko Seger. The couple were childless and therefore beseeched the assistance of the mountain gods. The gods granted them 24 children but stipulated that the 25th child, named Kesuma, must be thrown into the volcano as a human sacrifice. The gods’ request was implemented. The tradition of throwing sacrifices into the volcano to appease these ancient deities continues today and is called the Yadnya Kasada ceremony. Though fraught with danger, some locals risk climbing down into the crater in an attempt to recollect the sacrificed goods that they believe could bring them good luck. 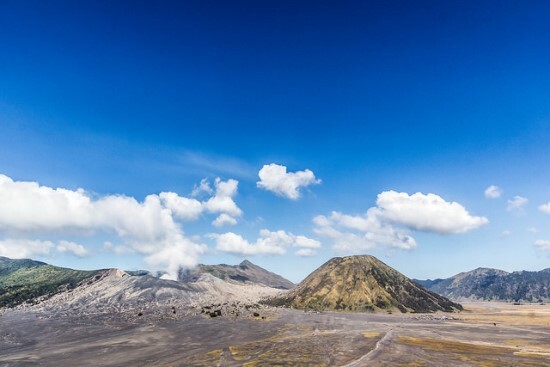 To reach Mount Bromo, you can fly to Juanda international Airport in Surabaya. There are direct flights to Surabaya from Singapore, Kuala Lumpur, Hongkong, Jakarta and Bali. From there, continue your journey to Mount Bromo by booking with a travel agent, or driving the Surabaya-Pasuruan-Wonokitri-Mount Bromo route. The journey will take 2-3 hours for 70 kilometers journey. Or you can use the train from Surabaya to Probolinggo, with the fares 40.000-50.000 rupiahs for 2 hours trains. 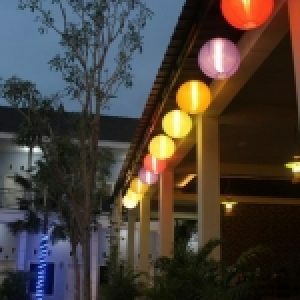 Later, it is best for you to leave Surabaya at 23:00 PM – 24:00 AM in order to arrive in time for sunrise. 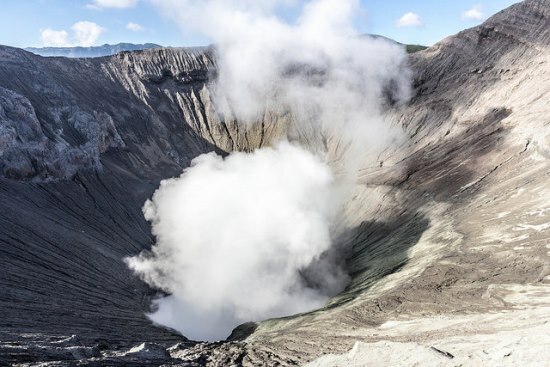 Or you can stay overnight at one of the hotels at Prigen,Tretes at the base of Mount Bromo or the nearest city Probolinggo, to make sure that you are on the crater rim before sunrise. The best time to go hiking Mount Bromo is between June and August, especially in August when the Kasada Festival is held in that month. From Sukapura, we can go to Bromo (Ngadas) by using Bromo’s taxi called Bison (the ELF type car). 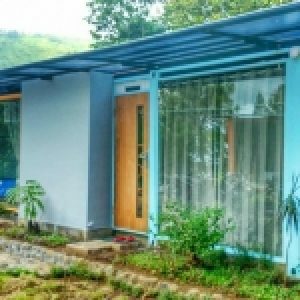 The rental fee around 150.000-200.000 rupiahs with the capacity up to 15 peoples. From Ngadas (the latest point where we can use public transportation), we can rent Hardtop car to go to Sand Dunes and Penanjakan. 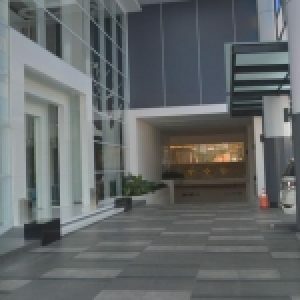 The rental fee around 300.000-350.000 rupiahs. Beside that, we can try riding horse and motor trail.